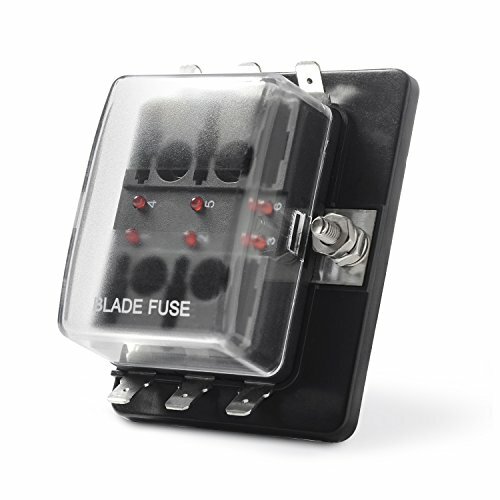 This is a 6-way blade fuse block that a common bus supplying power for 6 circuits at the same time, suitable for auto/old motor/off road cars/ship and others, such as the installation for trailer brake controller, GPS, car alarm, auxiliary lamp, headlights, etc. Give Your Auto a Professional Aftermarket Look!! There are unique LED indicator lights of each circuit that flash red if the fuse is blown. It allows you to check the troubleshooting immediately, making your auto more professional! It is a perfect kit for adding a few circuits to your auto, boat, off-road or others if all you need is something simple. Made of tin-plated copper common sourced bus, good productivity and corrosion-resistant, it is the absolute best! Mounting Torque Rating: 8 in-lb(0.9Nm) max. We sell it and stand behind it.1 Yr MICTUNING Warranty and lifetime Friendly Customer Service.